For some Bruin fans, The World is Not Enough. But NO Bruin fan can be happy this week, after the UCLA Football team’s View To A Kill saw them regress to the Neuheisel/Dorrell Eras, by giving lowly Cal a License to Kill, and getting The Living Daylights knocked out of them in Strawberry Canyon on Saturday night. Just when you thought those depressing days were behind you… Never Say Never Again. Even a quality Coach like Jim Mora is going to have setbacks. The big “Q” is, can the Bruins bounce back? Do they need a few GADGET plays to put a big 007 points on the board at a crucial time? Are Sheldon Price and Aaron Hester truly deserving of their starting roles? Is there really no one on the bench that can cover receivers any better than Price? Or keep their composure better than Hester? Is Jerry Johnson’s rib cage injury really the reason for his underwhelming production? What happened to Steven Manfro on Saturday? Why isn’t Jonathan Franklin getting more rushing attempts? When Rick Neuheisel is critiquing Mora (logically and successfully) on TV, you know something is wrong. Losing to #10 Oregon State may be forgivable, but getting blown out by a previously 1-4 Cal team is not. With lowly Utah coming to the Rose Bowl on Saturday, the Bruins have a golden opportunity to get back on track. The Bruins are favored by just under one touchdown, and barring a fluky Ute start like they had last Thursday (going up 14-0 on u$c off two early Turnovers), the Bruins should trample Utah. And if the Bruins DO win big, it doesn’t mean that everything is copacetic — It just means that they can beat bad teams at the Rose Bowl. They would still need to prove that they are a decent team in the weeks to come. But if they get upset by Utah, you can settle into your Barka-lounger and accept that Mora has not accomplished the quick fix that many had thought he had, and that the outlook for the rest of the season for Bruin fans, especially the Rivalry Game, is gravely bleak — Live and Let Die. Now, here are 30 more UCLA Cheerleader photos… For Your Eyes Only. 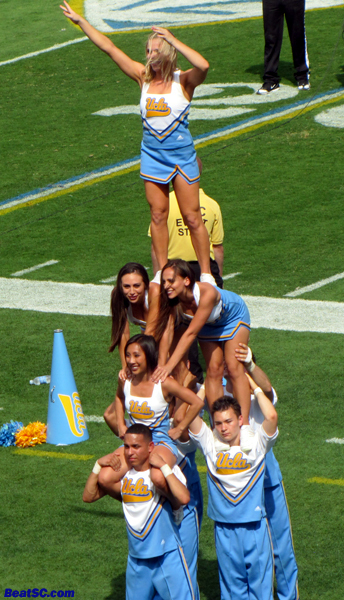 "SKYFALL" was published on October 8th, 2012 and is listed in UCLA/usc/Cheerleader Photos. I had to drown my sorrows with the aid of a very dry martini (shaken, of course).